Depending on the length and width there are different styles of wedding veils. In order to choose the right style of wedding veil for you, you need to consider the tips we talked about in our previous posts. 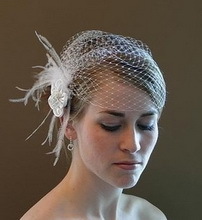 Very short style- very short veils, such as visor veils, do not extend past the chin. If your bridal gown has a high neck detail, this style of wedding veil can work well. Shoulder length style- shoulder length wedding veils are around 20 inches in length. They are perfectly suited to dresses that have bust, waist, or lower back details. 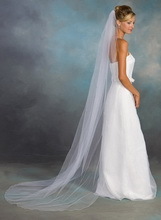 Elbow length style- approximately 25 inches long, this wedding veil falls to around the elbow. They can work well with romantic ball gown style dresses, because they end where the fullness in the skirt begins. Waist Length style - this wedding veil is just slightly longer then an elbow length veil at approximately 30 inches. They suit most dress styles that do not feature a train. Fingertip Length style- one of the most popular lengths, when you stretch your arm out it reaches around your fingertips. They are approximately 36 inches long and also suit the majority of dress styles. Knee Length style- a knee length wedding veil is approximately 45 inches and reaches to around your knees. It looks good with mid calf length wedding dresses. Chapel Length style- slightly shorter then cathedral length; these veils still drape onto the floor. They are typically around 90 inches long. They are best partnered with dresses that feature a train. Cathedral Length style- the longest and therefore most formal, these veils are usually around 120 inches long and some extend up to nine feet along the ground. They work best with full length, classic wedding gowns. 54 inches style -this is the sleekest version, with limited fullness at the top and sides. This style hangs behind your shoulders, which means it is ideally paired with dresses that feature decorative straps or sleeves. 72 inches style -this veil is moderate in height and width. It offers some coverage around the arms, so it is a good match for simple shoestring strap dresses. 108 inches style-this veil is the widest and has the most fullness on top. It comes around to cover the arms. This style is great if you are wearing a strapless dress and would like some coverage around your arms and shoulders.